Need some adventure in your life? 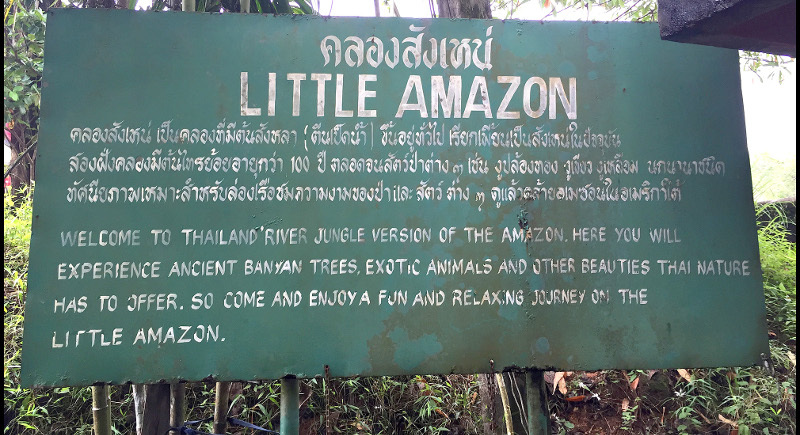 Why not explore Phang Gna's jungle and check out 'Little Amazon' in Takua Pa.
Past the entrance to Little Amazon, you will arrive at this village. While driving over the bridge heading for Khao Lak, our original plan was to check in to a hotel and relax, but plans changed. First, we detoured for lunch and took a look at Thai Mueang Beach, which is between Phuket and Khao Lak. No hotels there, just a few restaurants and a small turtle sanctuary and several kilometers of beach. I’d like to stop there again and write something on the blog. Then, rather than check in to a hotel, we decided to drive past Khao Lak another 30 kilometres to Takua Pa.
We have explored this area before, notably the old town which has a Sunday market. From our house it’s about two hours to Takua Pa. We had checked out the “Little Amazon” location last year, but did not do the tour as the weather was not great. This time, the sky was partly blue and we decided to try something new. On arrival at the car park, we were the only people there and we wondered if it was closed, but a guy appeared to help and my dear wife negotiated a price of B1,000 for two boats (four of us, two per boat). I imagine if you book in advance, they’ll be ready for you. We had to wait a while as the guy called a friend who turned up with small longtail engines for the little boats and after about 15 minutes waiting, we were ready to go. We were not sure what to expect. I was hoping for some big snakes! The first section of the river took about 45 minutes, sometimes using the engine, sometimes just a wooden paddle. 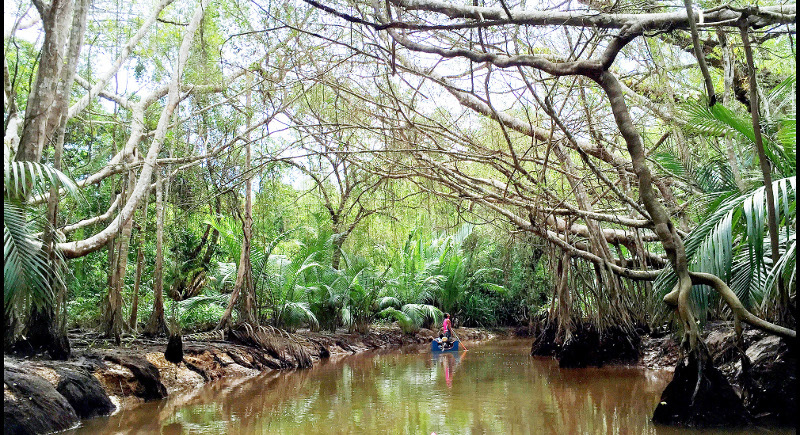 It was a narrow, jungly tributary of a larger river that leads to the sea at Ban Nam Khem. We moved slowly and after the first few minutes where we followed a road, we were really “in the jungle”. While being on the lookout for giant pythons, we checked out the jungle scenery. My daughter and I shared a boat and we loved the aerial roots hanging down from the trees. We were at low tide and you can see that the roots would dip into the water at high tide. These are banyan trees? I’m not sure! We enjoyed our little boat ride. Oh, yes and we did see some snakes, and a fleeting glimpse of a few monkeys and some crabs. I should have brought a decent camera with me, because the snakes we saw were all in trees and not easy to photograph with an iPhone! If you want photos, bring something with a good zoom lens. On checking a map, I can see that this 45 minutes only took us a short distance – less than 1.5 km from the starting point, so we were indeed going slowly! We then hit a much wider river, about 30 or 40 metres wide, and turned left downstream towards the sea. 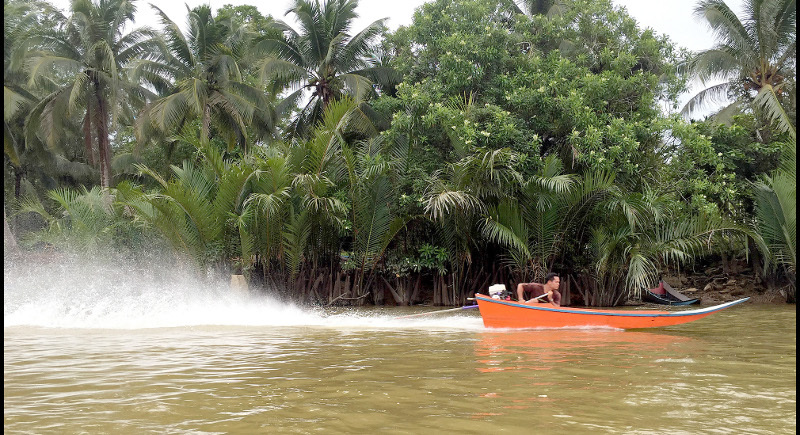 As the boatman said: “Go this way to Phuket!” We turned on our engines and got some nice breeze blowing. It had been a bit hot and sweaty there on that little jungle river! We had company on this bigger river. There is a network of rivers in the area. If we had turned right we could have joined a bigger river, headed further north and ended up at the sea 15 km further north. Takua Pa actually used to be a well known port for traders hundreds of years ago. The wide rivers provided a safe, sheltered place to anchor, just as the sheltered east coast of Phuket did, and Phuket was also an important trading port. We didn’t see any big boats here, only little longtails like the one in the picture. We passed under a road bridge, somewhat destroying the illusion of remote jungle. 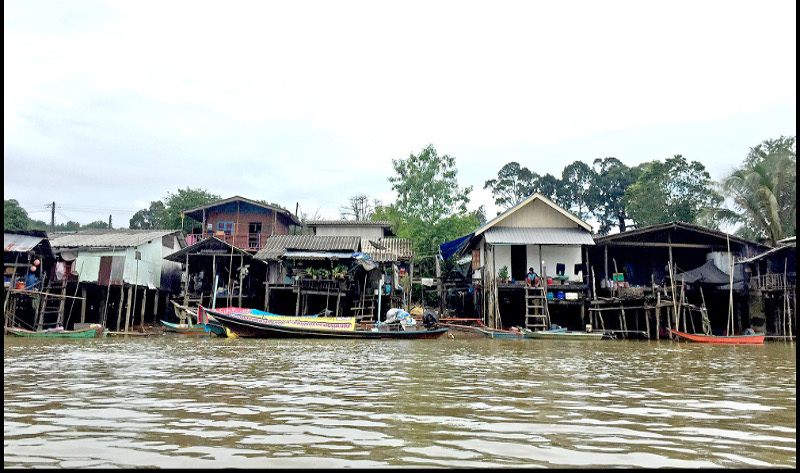 Next to the bridge was a small fishing village, which is actually only a few kilometres from Takua Pa town. Indeed if we carried on the same road from Takua Pa, passing the entrance to Little Amazon, we’d have arrived at this village. Then we had a little photo stop on a sandbar in the middle of the river. Just around the corner from the bridge and village and probably about 4km from our starting point. Hey this is not actually the Amazon, just a Little Amazon! The boat guys took some nice family photos for us. day trip from Phuket, though better as an overnight trip and a day trip is even easier from Khao Lak. After the trip, we actually decided to drive home and save money rather than staying in a hotel There’s actually rooms right there (sorry, don’t know the price!) and a restaurant. We had an early dinner there (decent enough Thai food at a decent price) before driving home to Phuket. I think if we get visitors who want a little jungle experience, we’ll come again.